The Devil’s Hole Family [DHF] held their 3rd Annual Back To School event at Devils Hole public dock on September 3rd. The event was put on with the assistance of key organizer Barry Gibbons and the DHF community. Organizers, volunteers, and children flooded the public dock to support the event that went from 1pm -11pm on Sunday with activities ranging from jet skis, fun castles, rubber rings, food and snow balls to a giveaway of back packs and school supplies. Present at the DHF event was the area MP Sylvan Richards who has supported the community event for the last two years. 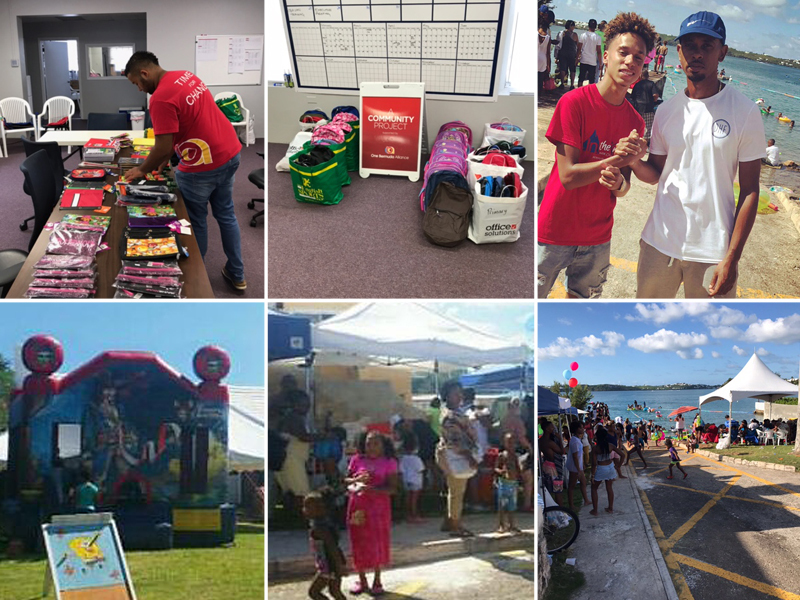 There are a host of sponsors and donors for this event including the Future Bermuda Alliance, the youth arm of the One Bermuda Alliance, which donated 20 bags and filled an additional 30 bags with school supplies for the children who attended Sunday’s event. The Future Bermuda Alliance had their first public giveback under new Chair, Justin Mathias, who immediately after learning about the event contacted organizers to see if they needed any help. “We got in contact with Barry to see if we could help in anyway,” he said. ”I have personal connection with the area as my sister and nephews have lived there their whole lives and canvassing with MP Sylvan Richards for the last two elections has expanded that connection. Mr. Mathias added that he would like to thank Barry Gibbons, Devil’s Hole Family community, area residents, OBA Parliamentarians, and the staff at English Sports Shop and Stationary Store. “On behalf of the FBA we wish all the children the very best in the coming school year and thank all the teaching professionals for their dedication and commitment to our future,” he added. The press release gives the appearance that the event was heavily sponsored or promoted by the OBA. That is factually incorrect. The event was primarily a community event initiated by Barry Gibbons of Souljahonemusik and his extended family, for the 3rd year. Donations were both financial and ‘in kind’ including food, tents, gift bags etc. Politically, both the PLP and OBA assisted with financial donations. MP Richards sponsored the games and Senator Anthony Richardson was responsible for the 5 free jet skis that were provided by Antwan Albouy. The jet skis allowed many children (and adults) to have their first jet ski rides across Harrington Sound. PLP branch #7 also provided a financial donation. Overall, a good example of the community working together. Again – congratulations to Barry for his community vision.